Log Cabin in peaceful setting. 4 BR, 3 FBA, (Sleeps 8), Rec Room, Wi-Fi, etc. The Ridge View Chalet was built in 2007, comes fully furnished, and sits back off the beaten path, not in a busy development, but in amongst the quite natural beauty of the area and the wispy pine trees. It is centrally and very conveniently located between Virginia, Maryland and Pennsylvania and is less then two hours to nearby Baltimore and Washington, DC. 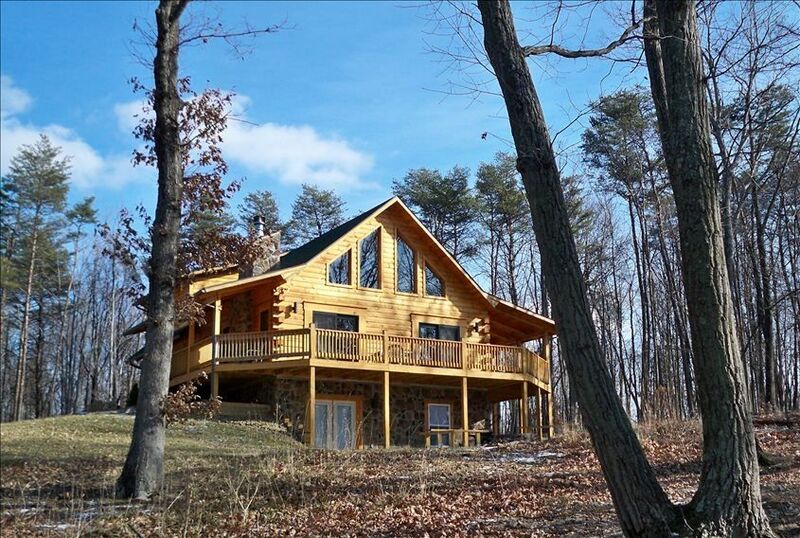 This true Log Cabin, has 3 fully finished levels, with 4 bedrooms and 3 Full Baths, can accommodate up to 8 guests, is located within 5 minutes of Cacapon State Park, which offers an 18-hole Robert Trent Jones golf course, more than 20 miles of trails for hiking, mountain biking, horseback riding, swimming, fishing, picnic areas, basketball courts, tennis, and a restaurant and recreation center. The Chalet is also minutes from the historic town of Bath/Berkeley Springs, where you can partake in its natural mineral baths, local art, antiques and the Berkeley Springs State Park. Nearby, the resorts of Coolfont and The Woods provide many amenities, such as spas, fitness center/gym, indoor swimming, entertainment, sledding, and restaurants. For ski and snowboard/tube lovers, the chalet is just a 30-35 minute drive to White Tail Ski Resort and other ski/snow tubing locations. Other popular sights and activities include the C&O Canal Park and Trail, Rails to Trails, the Paw Paw Tunnel, Cacapon and Potomac River float trips, Civil War Battlefields, and historic Harper's Ferry. The large A-frame style Log Cabin offers three levels of beautiful surroundings and views, with numerous large sun filled windows, and custom/mood lighting at every turn. The top level has a spacious Loft with Balcony, desk with Netbook computer, 2 Bedrooms (1 Queen and 2 Twin), and Full Bath. The Main Level offers a luxurious and cozy living and dining area, with a floor to ceiling stone Fireplace with custom Log Mantle, Satellite TV, Verizon DSL High Speed Internet service with wireless router, DVD/VCR player and iPod capable Stereo. A fully equipped Kitchen on the main floor includes a dishwasher and microwave, plus the breakfast bar area with a FPL matching stone front. A gas grill is also available. The Master Bedroom with King Size Bed is on this level, along with the convenient Main Level Laundry Room! Downstairs is a full walkout basement with Family Room, Dart Board, Ping Pong Table, Pool Table, satellite TV, DVD Player, the 4th Bedroom with Queen Bed and another Full Bath! We also own a cottage rental in Treasure Lake (Dubois), PA (vrbo # 703095). So PLEASE check us out there as well ! Owner grew up near the Chesapeake Bay in Maryland, moved to Westminster, MD after getting married, and now lives in southern PA with his family (wife and 2 children). Owner attended college in Philadelphia, PA and my wife attended the University of MD. We also own a cottage rental in Treasure Lake (Dubois), PA (vrbo # 703095). So PLEASE check us out there as well ! The Ridge View Chalet is in the back, more hilly area, of a small private community in a peaceful, slower paced setting away from it all. Traveling to the Berkeley Springs area from any direction is very scenic and is typically a breeze, away from the fast paced hustle and bustle of the city and other stressful "work" environments. Centrally located off of Route 522 and a short distance to Route 70/68, this cabin is a perfect meeting spot for families and "old friend" get togethers. The town of Berkeley Springs has so many neat, "quirky" shops along with the warm springs, park and spas you will just love to tour. Relax in our living/dining room, porches, deck, lower level rec room that will seem to sweep all your work, school and all your other worries away. Look up enjoy the beautiful star lit night sky at night. We have hopefully thought of everything to make your stay enjoyable, from the pool/ping pong table, modern bathrooms, flat screen TV, books, videos, DVDs, and games, down to the fully stocked modern kitchen. Do yourself a favor and book this cabin! Spacious, immaculate, and well kept. We had 6 adults and 2 kids with plenty of room for all. Great fire pit for roasting marshmallows and lots of deer to watch from the covered porch. Steve was a responsive and helpful host. Awesome stay! A perfect moms weekend away! The cabin was amazing, so well kept and cared for. Perfect layout, loved the big windows and open living area. Enjoyed relaxing in front of the fire plave. Took a walk around the property for some fresh air. Overall we couldn’t have asked for a better weekend getaway! This was our second time at this house. So comforting and clean. We will be back! It was the perfect retreat for a long weekend away! The house was stocked with all the amenities you can imagine plus so many extras. It was spacious, clean, and comfortable. We essentially got snowed in for the weekend due a winter storm and thoroughly enjoyed the fireplace, watching movies, and playing games. The drive up to the house requires 4x4 in the winter and we had no problems getting in and out after the storm. One of the neighbors had a snow plow and cleared the roads during our stay. We would absolutely stay at the cabin again. Thank you for the review and we are glad the weekend worked out for you guys! Our family recently lost a husband, father and grandfather. Therefore, we decided to celebrate the holidays in a non-traditional manner by renting this chalet. The accommodations were perfect for the entire family and gave us all the space, but also privacy, we needed. The chalet has a beautiful open kitchen, dining room, and family room, where we created many fond memories. We also enjoyed the playing pool and some of the many games available. We plan on coming back over the summer, when we can take advantage of the close-by Cacapone Resort State Park. Lastly, Steve was very accommodating and always responsive to any questions we had prior to, during, and after our trip. Rates include cleaning - 10% Hotel/Room Taxes Additional Ask about our 3 day weekend specials! Holidays: (2 night min) $295 per night, or $1,500/week Fully Refundable Damage Deposit of $250 for groups over 4.